Code FREDPAK6 With coupon only. Coupons may not be combined with any other offer. With Valpak® coupon only. Coupon valid at this location only. Coupon void if altered. Expires 05/04/2019. Code FREDPAK5 With coupon only. Coupons may not be combined with any other offer. With Valpak® coupon only. Coupon valid at this location only. Coupon void if altered. Expires 05/04/2019. Code FREDPAK4 With coupon only. Coupons may not be combined with any other offer. With Valpak® coupon only. Coupon valid at this location only. Coupon void if altered. Expires 05/04/2019. 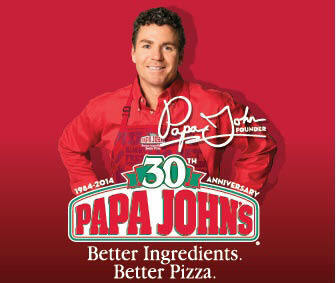 Papa John's Pizza located on Jefferson Davis Hwy, Fredericksburg, Va, we believe better ingredients make a better pizza. Over the years, this passion for making better pizza informed every decision and pizza we made... because the last thing we wanted to be was a pizza company. So instead of chopping vegetables with machines, we chop them by hand every day. Instead of investing in gimmicks, we invest in fresh ingredients. And we pile them high on our fresh, never-frozen original dough. If your pizza doesn't meet the quality standards you expect from Papa John's, we'd like to know. Order online for pick-up or for delivery today!